This is a kitchen witch’s recipe that was given to me recently. Chocolate is romantic and very sensual. This recipe is perfect for Valentines days or the Wednesday or Friday before the holiday. Chocolate makes people happy, eases depression and is calming. A lot of times witches use chocolate in their potions or treats to give to the object of their obsession. Strawberries are known as lover fruits. In classic literature and modern day romance novels, lovers are always romantically indulging in chocolate delights. Charge the pink candle with you intention. Spend some time meditating on your desired outcome in order to have a clear picture in your mind’s eye. This very powerful spell can be used to manipulate someone’s will to a certain extent. To do such a thing, like trying to force someone against their will is immoral and will have its own consequences. Instead you should use your power to set the grounds for a strong friendship and healthy possible relationship. Cast your circle as you normally would and light the candles and incense. 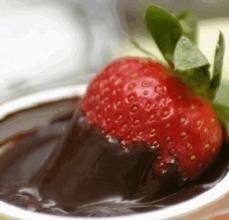 Take a strawberry and dip it into the melted chocolate and place it on the oval plate. As you dip each strawberry see a different picture of an evolving relationship with that person. See yourself sharing a picnic. See yourself going on a romantic date. See each seen as clear as possible and say ‘so mote it be’ after you place down each strawberry. Share the strawberries with your love and prepare for your relationship to blossom immediately. This wonderful spell is very powerful; it would be unwise to do this spell if you are ready for the following consequences. It’s not right to lead someone on or to do a spell on someone who you aren’t ready for a serious relationship with. This spell should be done on the night of the new moon if it is a new relationship, the night of the full moon if the spell if for someone who doesn’t know you or is angry with you, and during the waxing moon to attract love to you.